Hotspots in dogs are a common skin problem which afflicts dogs more in the summer months. They are a moist dermatitis. They appear as a reddened area that often oozes pus. They are uncomfortable for your dog and should not be left untreated. The medical name for hotspots is acute moist dermatitis. They are not life threatening but, they can be extremely uncomfortable for your dog. They appear quickly. You could leave your dog at home in the morning, only to return that afternoon to find a hotspot has developed. 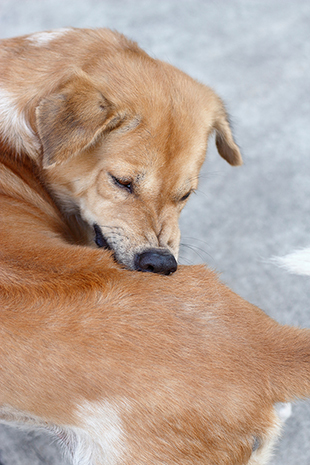 Hotspots are caused by the dog constantly licking or itching at an irritation on the skin. This leads to the start of a hotspot. It is a self-perpetuating problem because the hotspot continues to itch leading to more licking and so on. The dog will become more and more uncomfortable. While the immediate cause of a hotpot will be the dog itself, there is always some underlying cause which is making the dog start licking or itching. There are many possible causes of the licking/hotspot cycle. It could be started by something as simple as an insect bite. In fact, anything that causes an irritation of the skin can trigger the behavior that causes hotspots. Long-haired or thick-coated dogs are more susceptible to the condition. Hot moist weather conditions can be a contributing factor. Hotspots are fairly easy to spot. They are hot, moist and red. They are inflamed by the dogs repeated licking or gnawing. The area affected loses hair and is sensitive to the touch. They often produce pus which can lead to crusting of the surrounding area. They are self-induced and can grow rapidly. Hotspots are not contagious. However, if the underlying cause of the problem is a parasite infestation, the parasite may move on to other pets. There are some things you can do to treat hotspots at home. There are four stages to the treatment. Firstly, remove the hair from around the lesion. Shave the hair back to an area of healthy skin. It is a good idea to use a marker to trace the edge of the wound. This will help you work out if the affected area is expanding. Any unshaved areas around he wound can provide the perfect environment for the wound to spread. The next step is to kill bacteria using a disinfectant. Betadine or Chlorhexidine are often recommended. An antibiotic cream will often be needed to kill the bacteria at a lower level. The disinfecting and cleaning process should be repeated as often as is needed to keep the area clear of pus. In the early stages of treatment, this could be as often as every two hours. Next apply a topical solution to the wound. This is to cool and soothe the area. Finally, keep your dog away from the wound. This is the most difficult part and may require the use of a cone. It will take a few weeks to get your dog’s skin back to normal. Keep a close eye on the area. If the hotspot is expanding, your treatment is not working, and you should take your dog to a vet. Identify the underlying cause of the hotspot. This will help you prevent future problems. Once you have identified the cause (and you may need your vet’s help to do this) you can decide on what needs to be done. This is normally common sense. For example, if your dog is suffering from flea allergy dermatitis, he will need a flea control program. If the cause is a food allergy, he will need a change of diet. Regular grooming will help prevent issues arising. It is a good idea to clip long haired dogs during the summer months. Rivers, lakes and other bodies of water can contain bacteria which could infect wounds. If your dog is prone to hotspots it may be better to keep him away from water.